After another busy weekend of rugby, we're still getting our ducks in a row so figured we'd stick up this fun clip for now, the series of which we're hoping to feature regularly as the season continues. 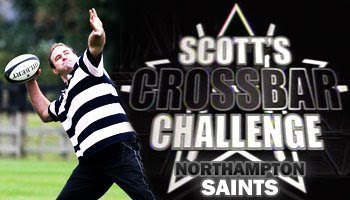 Former British & Irish Lion Scott Quinnell will be competing in a new feature on the Rugby Club as he looks to take on all challengers in the Guinness Premiership with the rugby version of the Crossbar Challenge. The test of distance and accuracy comes about from Quinnell’s natural ability to throw the ball through the posts from the ten meter line. The former Wales number 8 is looking to take on all before him, as he travels around the country seeing who has what it takes to to throw the ball from 40 metres, over the uprights and between the posts, in one attempt. "I'm confident that my arm is still very much the one to beat; I've been practicing my quarterback throwing, and it's great fun heading to the clubs and taking on the boys on their home turfs. I'm determined to show them how it's done!" In the first episode we see Quinnell at the Northampton Saints, taking on a team that clearly has a helluva lot of team spirit and more than a few characters in the squad. We won’t tell you what happens, but what we will say is that if this clip is enjoyed by all, we’ll do what we can to feature it on a weekly basis. "Scott Quinnell is taking on the might of the Guinness Premiership in a new Rugby Club feature,...."
so lets hope its a regular! Excellent stuff. I'm backing Danny Grewcock to beat him at the mighty Rec. and whats with dylan hartly at the start? haha, maybe as somebody who spent some time playing American football this clip is funny just in terms of how many of these big fellas cant do this. I know a rugby ball is a little more difficult to throw overhand than an American football, but I'd say that if you took a sampling of your average american high school football team you'd be hard pressed not to find 7-10 guys who could do this. That being said I always enjoy these clips that give a little more personal look at the giants of the game. Love it, keep it coming. As for more American football players being able to do this, do you think that might be because throwing the ball overarm is something you do in American Football whereas you never do it in rugby? Just a thought. here, Purchase A, reckon I could do that? please keep it coming! awesome! at the end of the season he should go and take on Cutler of the Denver Broncos! LOL! That was brilliant. Throwing the ball 40 meters? That's a strong arm. You'd expect at least all the hookers to be able to do that, although it is an awfully long way. good God, funny as heck. i think i'm gonna do one, but instead use a football, and then maybe try with a rugby ball. and when they started chanting 'macho man' to lobbe, i, for once in my life, 'lol'd. Grand - Quinnell is a legend. Post the series! lol brilliant! i love "fernandez lobbe song"
this "crossbar" contest was created by a french football tv-show named "telefoot" on TF1 channel, every sunday morning. you got that clip of his famous try against France? Quinnell is a beast, a big lump of Welsh beef :D.
I'd like to watch this weekly. Yea, I want Rugbydump to feature this every week as well. Brilliant, more of this please. I think that they where singing :"Nacho,Nacho men", not macho men,because here in South America we call "Nacho" to Ignacio. Frankyh- Euan Murray said "lightweight buddy" its a reference to the bodybuilder Ronnie Coleman who shouts that to psych himself up while he's lifting. id say about 90% of high school quarterbacks in america could do that. I doubt that 90% of american QB's could throw a rugby ball 40m so accurately! American Football's are a hell of a lot lighter. So what anyway, QB's are trained to do that. Get 50% of DT's or HB's to do it and i'd be impressed! "id say about 90% of high school quarterbacks in america could do that." you're wrong, american football is much easier to throw overhand than a rugby ball. not only it is lighter, it is smaller and more narrow, providing it has better aerodynamics to throw overhand. american footballs are designed to be thrown like that, rugby balls aren't. You can just imagine Jimmy Cowan taking a 3 step drop in the pocket and doing a skip 10-12-13-15 pass to Sivivatu this saturday in hong kong. That would be awesome. what on earth was Chris Ashton saying? great stuff. I'd like to see the guys from Quins and London Irish doing this. I bet they're a laugh. They were singing Nacho Man to Nacho Lobbe, Ben Foden is Pop Idol as he missed a Sale training session cos he was at a Pop Idol Audition, Euan says lightweight Barry in reference to Barry Stewart, another saints player, Chris Aston says "Wigan rugby league convert, also best looking guy in the team. Sean Lamont obviously Rorys bro. Also Dylan says Dylan West by mistake, the other guys in the team rib him saying he is Dorean West's son! murray says lightweight party, its a joke cuz hes fairly light for a prop and front row and sometimes called heavyweight party.